Our top picks are based on our own proven thoroughbred and quarter horse mathematical formula. Utilizing money earned and in the money finishes taken from a competitor's historical data, we've created many powerful number for every horse in every race. Class handicapper? Use our class rating! Pace handicapper? Use our pace ratings! Speed handicapper? Use our speed ratings! We've spent countless hours on our array of ratings and we place them at your disposal. 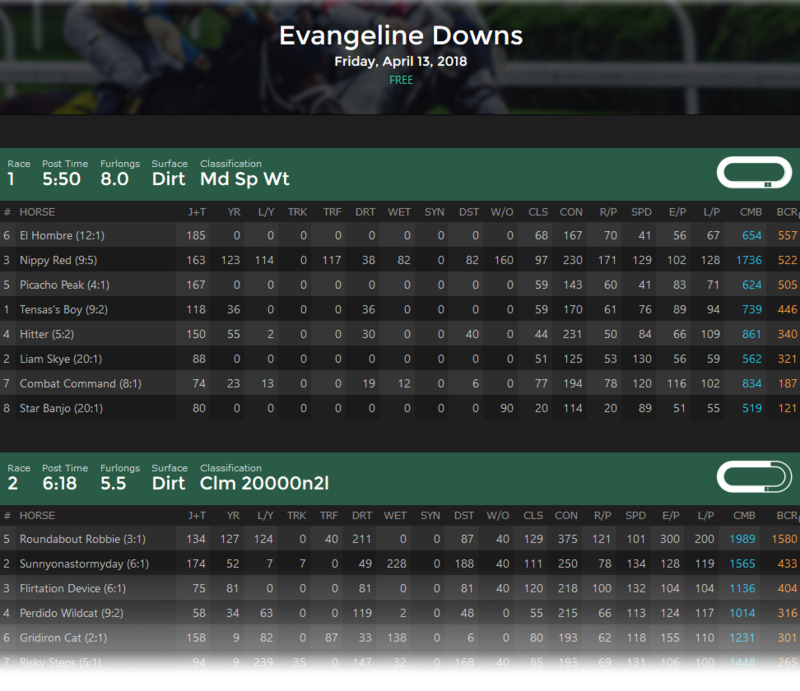 Our Combined Rating (CMB) gives you, the handicapper, the ability to easily and quickly tune individual factors to fit your own personal handicapping needs. Our handicapping formula is based on the accumulation of handicapping factors we believe are most important to you. Investing in consistent and legitimate contenders that offer you value for long term success is our goal for you, the dedicated handicapper. We offer sheets for most major North American tracks including Churchill Downs, Santa Anita Park, Belmont Park, Arlington Park, Del Mar, Keeneland, and many, many more! Our sheets are provided in a quickly accessible format designed for ease of use while still providing you with our comprehensive list of numbers we have available. Developed to be used on both desktop and mobile platforms, you can access our ratings quickly and easily. No matter if you're at home or at the track, you'll have access to all of the data you need. We strive to provide you with a simple and powerful service for all of your handicapping needs, and we are constantly updating to ensure your time spent here will be enjoyable. Thank you for visiting Betting Contenders!